Microfiber cloths are so effective at cleaning, the fabric is used in various cleaning products including rags, dusters, mops, and cleaning mitts. Microfiber is a synthetic material with fibers that are finer than ones you would find in many common cleaning fabrics. These fibers are made of a durable material to withstand wiping, mopping, and wringing out. Dense microfiber material means a high total surface area, great for absorbing large amounts of liquids and small particles of dirt at once. It’s also soft enough to be used on scratchable surfaces like glass or the clear coat on your car. 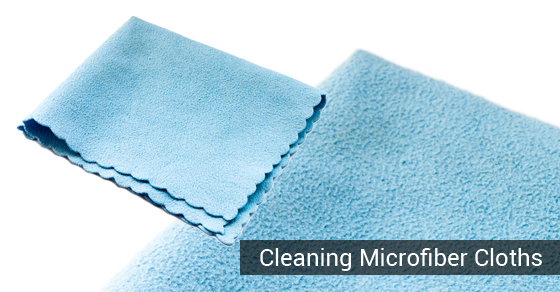 With a bit of care, you will be able to use your microfiber products for up to hundreds of washes. Microfiber cloths are not delicate like silk, so you can go ahead and throw them into the washing machine, although it’s important to remove sharp objects such as pants with zippers from the load. In addition to avoiding pulling fibers from the microfiber, crushing the fibers is also ill-advised, so don’t pack the cloths into mesh bags or a full load of laundry. Cold water is fine although for disinfecting, it’s safest to wash with water at 200 degrees Fahrenheit. Be careful when choosing the cleaning agents you pour into the laundry. Perfumed detergents will make the fibers less absorbent after washing and bleach damages the polyester over time. Additionally fabric softeners will coat the microfiber in silicone, making the cloth less useful. If possible, avoid exposing the cloths to phosphate and chlorine. It is always better to use less detergent than too much, so err on the side of caution. Choose a wash setting that uses lots of water to rinse away the massive amounts of dirt trapped in the nooks and crannies. Cotton produces a lot of lint that will find its way into the microfiber and clog the material. Follow the manufacturer’s instruction for best results. Because microfiber is made with durable synthetic material, drying at a high temperature is not a problem. Temperatures of 250 degrees Fahrenheit can be used to disinfect the cloth. Air drying will put less stress on the cloths but the fibers will tend to bunch up. After the microfiber is dry, it won’t be as absorbent and not as soft. Putting too much thought into how to clean your cloths properly may sound arbitrary, but when taking into consideration the fact that these cloths will touch surfaces that you will eat off of, sit on, touch and do a multitude of other things, it’s an essential step in keeping you and your family healthy!